HTC is rumored to be working on a new high-end device, the HTC A9. Previously, the company teased an event on September 6th where the A9 was expected to make its debut, but it didn’t happen. Recently, the Taiwanese company posted a teaser on Weibo for an event on September 29th in Japan where the company is expected to launch new handsets. The company is expected to launch “dual flagships” so we may not get to see one but two new handsets. 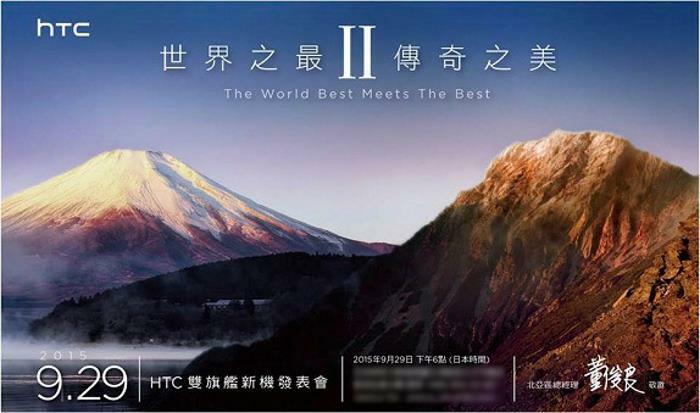 Rumors suggest that we may not only see the HTC A9, but the Butterfly 3 for the Japanese market, or something similar. As for the specifications, the HTC A9 is expected to feature a 5.2-inch display with a 2,560 by 1,440 pixels resolution and 2.5D curved edges, MediaTek Helio X20 processor paired with 4GB of RAM. HTC is currently struggling in the crowded, and competitive, smartphone market dominated by budget-friendly Android devices. The company did launch the new HTC One M9 earlier this year, but it failed to make a big impact in the high-end smartphone market. We’ll update you as soon as we hear anything more about the upcoming handsets from HTC.